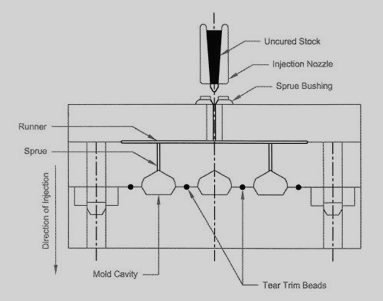 In the traditional “hot runner” system, the rubber compound is pre-heated in an injection cylinder, then forced under pressure through the injection nozzle into a network of runners and sprues, finally terminating in the mold cavities. This system results in the fastest production of finished goods, but can also result in significant material waste due to the scrap produced by the runner system. This scrap can be minimized by the use of a “cold runner” injection system at the expense increased cure cycle times. Both injection molds themselves and the specialized equipment required to run them are very costly, so for low volume jobs, it is usually more cost effective to use compression or transfer molding techniques. This process forms material into shape via heavy compressive force and elevated temperature. The method of choice when the finished part demands tight tolerances or involves complex geometry. The most efficient rubber molding process for rapid production of high volume, precision parts.